Uncertainty with British Brexit, waiting a Trump speech for Congress - all this put the market in stand-by mode. Now the market need certainty, and that’s what we are looking for. If you are able to predict the impact of future news, you can easily fund your account with the Forex broker. On the Forex market for a long time there are no any tendencies and trends. Currency pairs are in the flat, making conditions difficult for making money for traders. 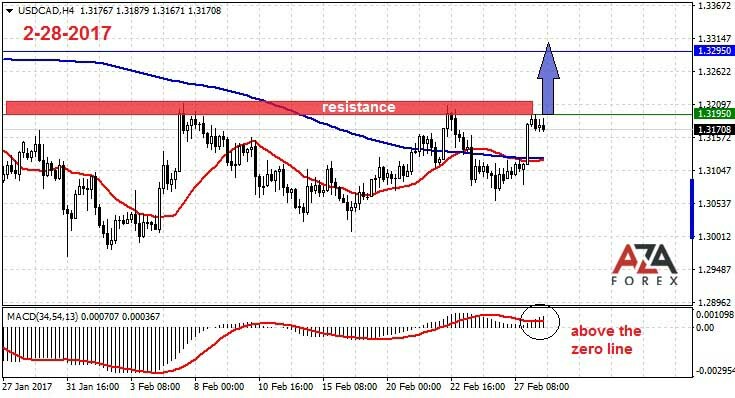 It was no exception and the currency pair US and Canadian dollar, which has been stored for several days in a sideways motion. Price does not accept of any particular direction. This situation may change if the traders that are set to buy the currency pair will start to operate. A recent growing momentum signaled to investors that the situation may change. Price is not very rolled back after the correction, which is a good sign, indicating the continuation of the current trend. If the price is able to overcome the near-term resistance and escape from this vicious circle, it can take more than 100 points. Keeping abreast of Europe and America, where the hottest news can give us profit.